The ROMOLD range of plastic manhole chambers have many significant advantages over that of concrete chambers which make them the logical chamber for plastic pipelines. Hofit were the first to produce polyethylene manholes when they developed rotational moulded chambers for the Israeli market back in 1978. Over 20 years of continuous development for the European market. ROMOLD introduced plastic manhole chambers to the demanding German market in 1992. From this beginning they have continuously developed their product to maintain their position as a market leader throughout Europe. It's true when they say that necessity is the mother of invention, for ROMOLD the need to satisfy the needs of discerning Engineers from across Europe has led them to develop the DN1000 injection moulded polypropylene chamber, truly a statement in product design! The BS EN 13598-2 standard is widely accepted as the controlling standard for plastic manhole chambers across Europe. The following countries have adopted this standard: Austria, Belgium, Bulgaria, Cyprus, Czech Republic, Denmark, Estonia, Finland, France, Germany, Greece, Hungary, Iceland, Ireland, Italy, Latvia, Lithuania, Luxembourg, Malta, Netherlands, Norway, Poland, Portugal, Romania, Slovakia, Slovenia, Spain, Sweden, Switzerland, United Kingdom. Plastic manhole chambers are widely accepted, so much so that in Europe almost 100% of chambers up to DN600 are plastic. In France almost 25% of sewer chambers of any size are plastic. On the back of this adoption ROMOLD have sold over 1,000,000 chamber components into the European market! 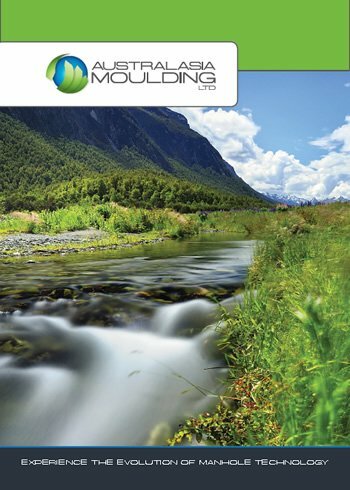 Australasia Moulding Ltd carry a significant inventory of stock and can have your plastic manhole chamber packed and in transit to your site within hours of your order being placed. No manufacturing lead time is required; it's simply order, pack, ship and arrival at your site. 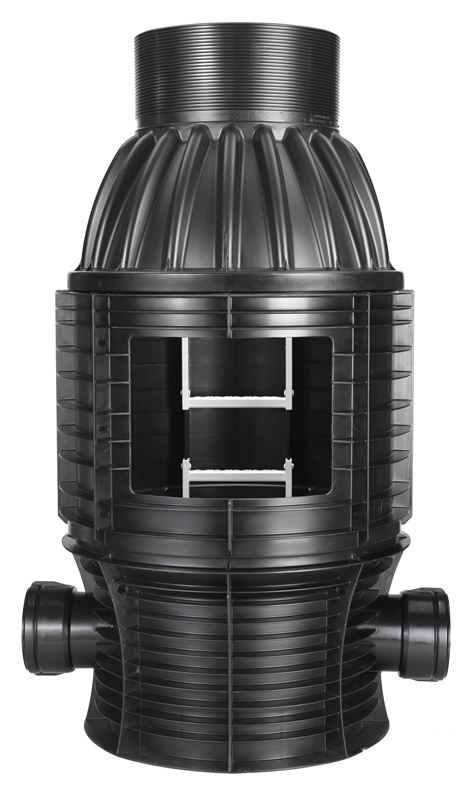 ROMOLD DN1000 plastic manhole chambers have a modular design. This allows maximum freedom to put together the solution that meets the requirements of the job. No fabrication is required which reduces lead time for delivery or time on site. All ROMOLD plastic manhole chamber bases are pre-benched – no labour is required custom building the benching at the job site. The ROMOLD DN1000 plastic manhole chamber has unique pipe sockets utilising rubber seals for connection of PVC pipes. Not only does this save time during installation but the seal achieved is second to none. The steps on ROMOLD DN1000 chambers are pre-fitted and do not penetrate the walls. No sealing processes are necessary and there is no risk of leak. ROMOLD chambers are adjustable in height to the nearest 10mm, with hand tools no less! A simple hand saw is all that is required to easily remove height from the chamber and ensure that the correct installation height is achieved. If drop pipes are required then you will save even more time. All chambers can be drilled using a common electric drill and cup saw. Simply add the ROMOLD pipe seal to create a robust and leak proof seal with the incoming pipe. ROMOLD chambers are easy to transport for a number of reasons. They are made from tough polyolefin material ensuring that no parts will be damaged in transit. The other big advantage is their weight, or lack of to be precise. Parts in the tens of kilograms are cost effective for transportation, can be handled without heavy machinery, and open up opportunities for streamlining of on-site processes. The process of shifting product from the materials storage yard to the install site no longer requires removing the digger from it’s work. A two person lift onto a flat bed or ute will be as much as is required for the heaviest components in the product range. Maintaining worksite safety is in the best interests of everyone involved with a job. With a ROMOLD DN1000 chamber weighing approximately 5% of an equivalent sized concrete manhole chamber, and then making this assembly modular, the risk of injury whilst moving or handling the product is significantly reduced. Assembling the ROMOLD DN1000 chamber is a simple and common sense process. Rubber seals between elements ensure the product achieves a perfect seal and simple body weight is all that is required to press elements together. Connection of the pipe is again straight forward, with each base containing sockets with rubber seals to simply insert onto the pipe and provide a robust seal. ROMOLD use the advantages of the injection moulding process to provide a flat base for their chambers. This greatly simplifies the process of levelling the chamber and ensures that compacting backfill becomes a straight forward process. With the designed-in features of ROMOLD products, the manhole chamber effectively becomes a pipefitting. Laying a pipe is now a simple process, with no further complexity required. ROMOLD DN1000 chambers come complete with slip resistant reinforced plastic stair rungs. There is no risk of these rusting away over time, allowing them to maintain sure-footed safety for the life of the product. Design flexibility allowed for by the injection-moulded ROMOLD DN1000 chamber means that the berm created on either side of the channel has a non-slip surface. Such as for the stair rungs the berm is light grey in colour, allowing greater visibility and therefore safety when entering the chamber. In consideration of the needs of some regional authorities, the steps within a ROMOLD DN1000 manhole chamber can easily be removed along with any restriction to suspended man entry. Sealing of the pipe to the chamber is achieved with sockets on the ROMOLD DN1000 chamber base containing rubber seals. No post processes are necessary, just insert the pipe into the chamber base and continue with the assembly process. With the ROMOLD DN1000 chamber being modular each element is sealed with a special Triple-Safety-Seal. Simple body weight is all that is needed to press the upper element onto the seal and you can be sure that the connection is 100% leak proof. All ROMOLD chambers are made from non-porous materials. This means that finished chambers are 100% sealed and will not suffer a lifetime of leaching their contents into the environment. ROMOLD have designed their stair rungs to be contained within the chamber. This means that there is no post process required to seal up stair rung holes, and no risk of leaking in the future. Polyolefin materials such as Polyethylene and Polypropylene are inherently tough, impact-resistant and superbly abrasion resistant. Abrasion testing has proven that polyolefin materials outperform PVC, Earthernware, GRP materials, and simply leave concrete for dead. ROMOLD DN1000 chamber channels have a coefficient of roughness consistent with plastic pipes. By implementing a complete plastic pipeline or network you will be achieving consistent performance across the whole asset, with no weak points added in terms of leak risk, resistance to flow, or chemical resistance. It is the common sense approach for many applications. ROMOLD DN1000 manhole chambers are designed for use with pipe from DN150 to DN400 – all with the same level of technology. ROMOLD DN1000 bases provide the full range of bend angles for single-entry single-exit chambers. 90°, 270° and every angle between can be catered for, such is the selection of base options available. ROMOLD DN1000 manhole chambers have a modular design, allowing the exact solution that you require, with no wasted materials or cost. ROMOLD DN1000 manhole chambers are suitable for Class D 400 applications allowing them to be used with freedom in most projects. In consideration of the needs of some regional authorities the steps within a ROMOLD DN1000 manhole chamber can easily be removed along with any restriction to suspended man entry. All ROMOLD manhole chamber product is in conformance of European standards for plastic manhole chambers EN 13598-2. All ROMOLD chambers are made from 100% virgin material. There is no risk of material contamination affecting the quality or the long life of the product. Polyethylene and Polypropylene used in ROMOLD chambers offers significant inherent advantages with respect to chemical resistance. ROMOLD chambers are the best option when there is a risk of H2S corrosion or corrosion from acidic soils. The steps used in ROMOLD chambers are made from fibre reinforced polypropylene. They are designed to withstand a load in excess of 2kN. They will not suffer from corrosion over the life of the chamber. The impact resistance offered by the Polyolefin material allows for trouble free installation on site. There is virtually no risk of cracking which eliminates the risk of costly repairs during the project. The toughness of the Polyolefin material used in ROMOLD chambers allows for ground movement without the risk of the asset cracking. Add this to the intelligent pipe seal design, and you have a long term solution that can be relied upon. ROMOLD DN1000 manhole chambers are designed for 100 year durability. In fact, there is no reason why the product will not last much longer than that. With the ROMOLD chamber design, inherent material advantages and smooth non-porous channel means that ongoing maintenance costs will be low. Certainly worth considering when specifying an asset solution for long into the future.